Printing has gone well beyond what we could have imagined decades ago. 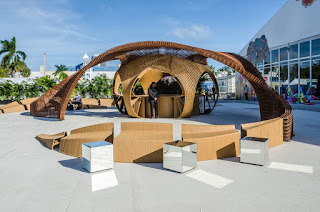 And this year’s entrance pavilion at Design Miami proves just that. The installation, titled Flotsam & Jetsam, was printed using 3D technology and stands as the current world record holder for largest object to be printed. Two fabrication partners were involved in creating this one-of-a-kind object that allows for a unique visitor experience. Standing at over 20’ at its tallest point, visitors can meander through the installation, saddle up to the bar or take it all in from nearby benches – each of which are 3D printed objects. Image what this could mean for the future of experiential marketing and “pop-up” retail outlets where we can literally print our own space? !